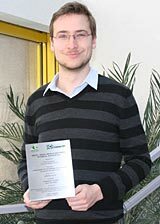 At its 45th International Congress of Cellulose and Paper held in São Paulo in October 2012, the Brazilian Pulp and Paper Technical Association (ABTCP) presented the Eucalyptus Award to Frédéric Pouyet, a PhD student at the Laboratory of Pulp and Paper Science and Graphic Arts (LGP2), for his lecture entitled "Improvement of the chlorine-free bleaching of eucalyptus kraft pulp". This award recognizes the best contribution in the field of the cellulose production from eucalyptus. Frédéric Pouyet, a Grenoble INP-Pagora 2010 engineer graduate, is carrying out his PhD in the Chemical Processes team of LGP2 under the direction of Professor Dominique Lachenal and Christine Chirat, Lecturer. In his lecture, he presented the first results of his research to improve the chlorine-free bleaching process of kraft pulp from a eucalyptus base. The objective is to obtain quality bleaching and physical and mechanical properties of paper equivalent to those obtained via bleaching with chlorine. This involves reviewing the ozone bleaching process method so as to limit the damage to pulp. Frédéric Pouyet’s quality presentation, technical and scientific value, relevance and applicability of the theme of this intervention impressed the ABTCP jury. The Eucalyptus Award given to Frédéric Pouyet and his co-authors Christine Chirat and Dominique Lachenal, highlights the interest of Brazilian industrialists for more environmentally friendly production processes. It also reflects the recognition in Brazil, a vibrant country ranked as the world’s fourth largest pulp producer, of the relevance and excellence of research conducted at the LGP2.